WACO, TX — Due to bad weather, Baylor's Green and Gold game was moved indoors and closed to the public. But, the Baylor Bears are looking good thanks to Head Coach Matt Rhule's ever-rising standards. "We came out on Friday at 6 a.m. Two injured guys showed up at 5:59 for a 6 a.m. practice yesterday and one guy wasn't here that's injured. So, I sent everybody home. I went to Magnolia Table and had biscuits," Coach Rhule said. The players stuck around and ran their own practice after he threw the whole team out. Coach Rhyule said he would've liked to pick his daughters up from school Friday afternoon, but the whole team wasn't there, and that begs the question: If the whole team isn't on time for practice the day before a game, is their mindset right? They came back at 3 o'clock to make sure it was. "The standard is the standard. To me, I'm just trying to up the standard every year, and I think going from one win to a bowl win has shown them that like hey, is a standard for last year gonna be good enough for this year? No, it can't be good enough. You always have to improve what you're doing. So, I've tried to up the standard this year," Coach Rhule added. "All these coaches, all they want to do is coach guys. They just want to come in and talk football. They don't want to have any unnecessary distractions on and off the field to come into this team and affect the team. 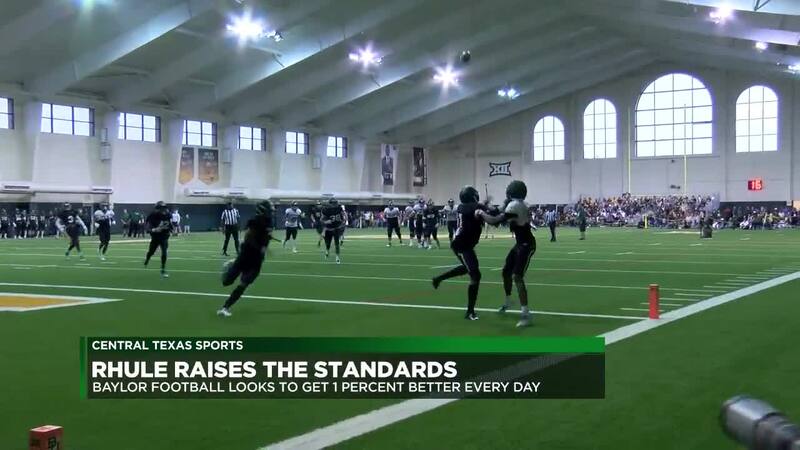 So, he really wants the older guys to set an example and bring guys along with them," James Lockhart, a senior defensive end for Baylor, said. Coach Rhule also decided to make the Green and Gold game live for his quarterbacks this year. Charlie Brewer has essentially earned the right to rest on the sideline, and that opens up reps for his backups to fight for the chance to move up the depth chart. And when they got that chance Saturday afternoon, Coach Rhule gave the defense the right to get after them. He said he'd rather see how they handle getting hit now, and save them from having the first time be in front of thousands at McLane Stadium. You know, not a lot of spring games, I betcha if you watch them on all the networks are gonna have the quarterbacks be live. I think you saw some toughness from Gerry, he got hit a bunch of times but he made plays. And he moved the ball down the field and Zeno got hit a couple of times, but he moved the ball down the field and same thing with Preston. So, I feel really good about the mindset and where that position's laying out," Coach Rhule said. All in all, Coach Rhule said he was pleased with how the Bears' spring practices went and what he saw in the Green and Gold game.